Hello Kitty has the Hiccups and it’s a good thing 😉). There’s a new coffee/boba shop in town and it’s called Hiccups. This delightful drink spot recently opened up in Carson, California. It’s the second location for Hiccups, with the first location being in Lakewood, California. It is always a treat for me to visit coffee/boba shops. From enjoying a quiet evening sipping a warm cup of tea to beating the heat on warm days with a slushie, drink shops are enjoyable. 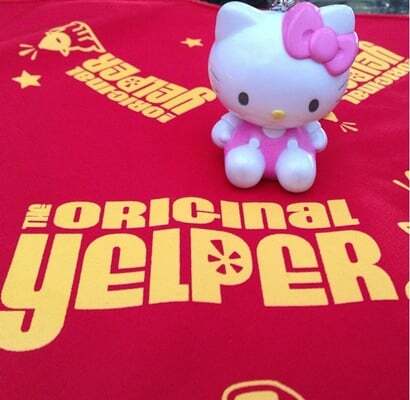 Hiccups has an extensive menu of both hot and cold beverages for every Hello Kitty Foodie’s drinking pleasure. They have iced teas, iced milk teas, mojitos, coffee, slushies, smoothies, hot teas, hot lattes and soft drinks. 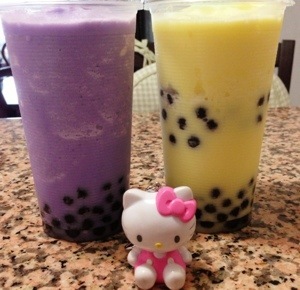 Some of their drinks even have some the cutest and kawaii names (Hello Kitty stamp of approval for that 😉). Some drink names that put a smile on my face included Pinch O’ Peach (peach raspberry green tea with real peach bits), Pink-A-Boo (strawberry peach blended with ice served with strawberry bits) and Fruity Booty (mango peach strawberry blended with ice served with peach bits). Being the big mango fan that I am, I chose to get the Mango Mango! This is mango flavored green tea, hand shaken with ice. I really enjoyed this drink. It was very refreshing and the taste of mango was abundant. There were even bits of mango inside the drink. One cannot live on drinks alone and thus alongside their delicious drinks, Hiccups offers up various appetizers, noodles, soups and rice dishes. Being a big fan of egg rolls, Hiccup’s eggroll trio is one of my top choices for appetizers. They give a triple treat here of crispy egg rolls filled with ground pork, veggies and vermicelli. Crispy and crunchy, they are great! Another favorite appetizer of mine is their popcorn chicken! The popcorn chicken is delicious! They give so much tender, crispy chicken! It is perfect with any of their drinks. Next up I tried the Garlic Noodle with Beef. When they served up this dish, the delicious aroma of garlic instantly hit the table. The aroma hypes up this dish right from the start and I am pleased to say the hype is real. Not only does this dish smelled good, it tasted good as well. The garlic noodles was topped with lots of tender beef, flavorful onions and crispy bell peppers. Not to be outdone by the noodles, is the rice dishes. The chicken fried rice was another winning entree in this foodie’s book. Similar to the noodles, the meat was abundant here. There were plenty of chicken slices along with carrots, peas and shrimp. By the end of my meal, I was one happy camper with a smile on my face and with some…you guessed it some hiccups 😉. 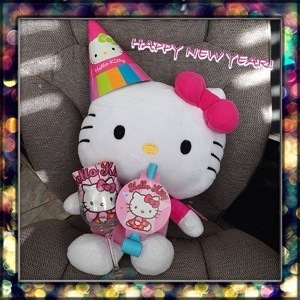 Yes, Hello Kitty has the hiccups and it is indeed a good thing ☺️. For more hiccups err smiles 😉 please see my Yelp review on Hiccups. Hello polka dot party ready for the New Year! There are several New Year’s traditions around the world but one that I remember from when I was a kid is about polka dots for the new year. In the Philippines, they say to wear polka dots on New Year’s Eve to bring prosperity and wealth for the next twelve months. This is because polka dots are shaped like a coin. When I noticed some tapioca pearls/boba at an Asian market recently, I thought of how perfect this would be for a New Year’s Eve…boba = polka dots ;). Fast forward to today, with me in my pink polka dot attire drinking some polka dot/homemade boba milk tea. Boil 10 cups of water for 1 cup of tapioca pearls into a large pot. Once the water is boiling, slowly pour 1 cup of tapioca pearls into the pot. Stir softly and the tapioca will soon become plump in size. Once you have plump tapioca pearls, turn the heat to medium and cover the pot for five minutes. 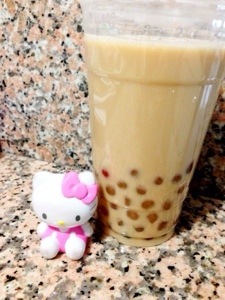 In parallel to cooking the tapioca pearls, I had prepared a cup of milk tea on the side. Once the tea was brewed and the tapioca pearls were cooked, I simply scooped the boba and added into my ready made tea. Polka dot party ready! I hope you enjoyed my little trivia about polka dots as well as my little post about a simple New Year’s treat! Happy New Year everyone! 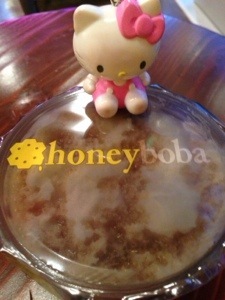 Hello and hi ;) Honeyboba! Today I said hi. 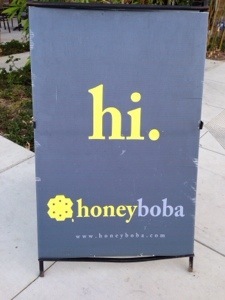 I said hi to the newest Honeyboba location and it was indeed the start of many smiles. I’ve been introduced to Honeyboba before. Awhile back I went to the Lomita location and anyone who read my Yelp review then knew I instantly developed a Honeyboba crush. 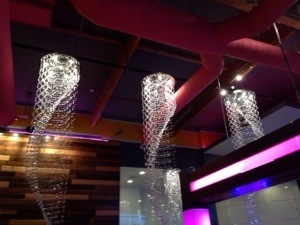 The pink booths, chandeliers and their taro smoothie with honeyboba simply won me over. 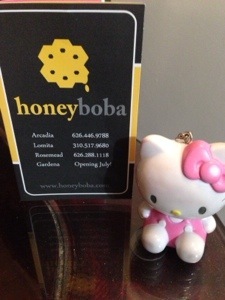 Aside from the Lomita location, Honeyboba can be found in Arcadia and Rosemead. Those places are a bit too far from me however. I was therefore super happy to learn about another South Bay location. 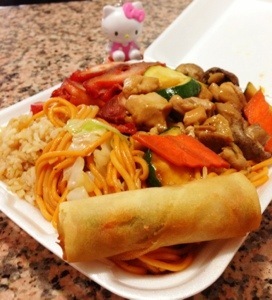 Just recently their newest location in Gardena opened! I got to try this place today. 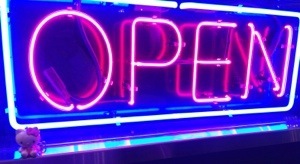 Just seeing the big “Open” sign made me giddy with happiness. Maybe it was the chandeliers all over, the pink border lights and the bright and sunny yellow booths. It could be the extensive menu consisting of fresh brewed classics, infused ice teas, royal milk tea, mountain oolong milk teas, ice crystal drinks, creamy smoothies, frosted signature milky drinks, crystal teas, fresh fruit juices and yogurt lush. It may be all the different flavors from Ghiradelli chocolate to Blushing Peach to Almond Coffee. 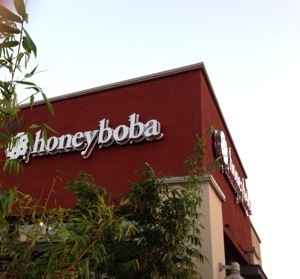 Maybe it was all of the above but once again I was smitten with Honeyboba. Apparently I wasn’t the only one with a boba crush. It was a fairly chilly night but nonetheless there was a pretty significant line of folks waiting for boba. My chosen drink was the strawberry + pudding + honey boba frosted signature milky. 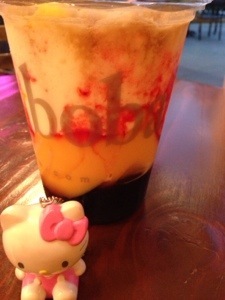 Lots of honey boba and soft egg pudding swirled around and filled this strawberry based drink. So cute! So sweet! It’s no wonder, I love this place. 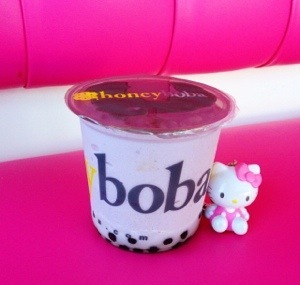 Hi, Honeyboba! You made me smile today. For more smiles, please read my Yelp review on the newly opened Gardena location. Another South Bay boba place! I went to visit Yami Teahouse’s newest location in the South Bay. This second location is in Gardena. (The first is in Lomita). My drink choice was strawberry boba milky drink with pudding. It was a large drink filled with lots of soft boba, red jellies and yellow pudding. This boba drink was very unique. I liked the milky strawberrry and the mix of boba and jellies. 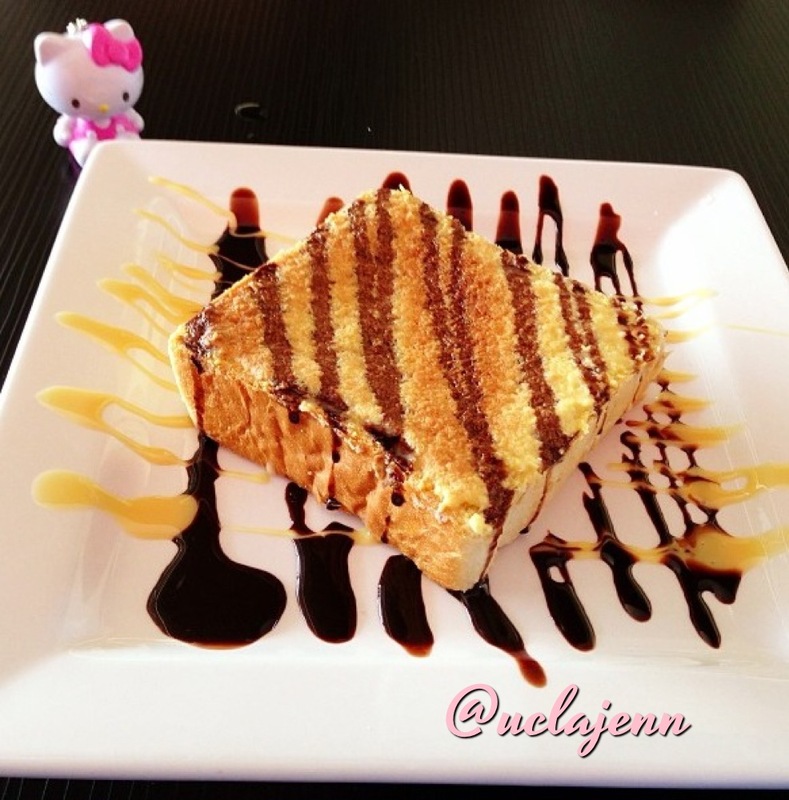 On the side I got a crispy coconut brick toast that was surrounded with chocolate swirls. It was my first brick toast ever! I loved the crispy edges and the soft middles. The chocolate swirls all around was such a sweet touch! For more smiles, please see my recent yelp review on Yami Teahouse.